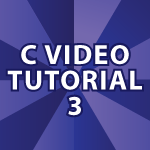 Welcome to part 3 of my C Video Tutorial! The code below is heavily commented and will help you learn. Feel free to leave any questions you have. // strings in a character array. // overwrite other data in memory. // because it can overwrite memory. // That is were strlcpy() comes in. // have to step out of main(). derek sir wanted to learn web development so could u plz guide me which of your tutorial I should take and their order. When I try the strlcpy function I get the error: undefined reference to strlcpy.